I am asking members of this forum for help, as I ended up down this alley as a result of exploring EMPTY MAGNIFICATION via Wavelet decomposition, and letting my imagination fly. 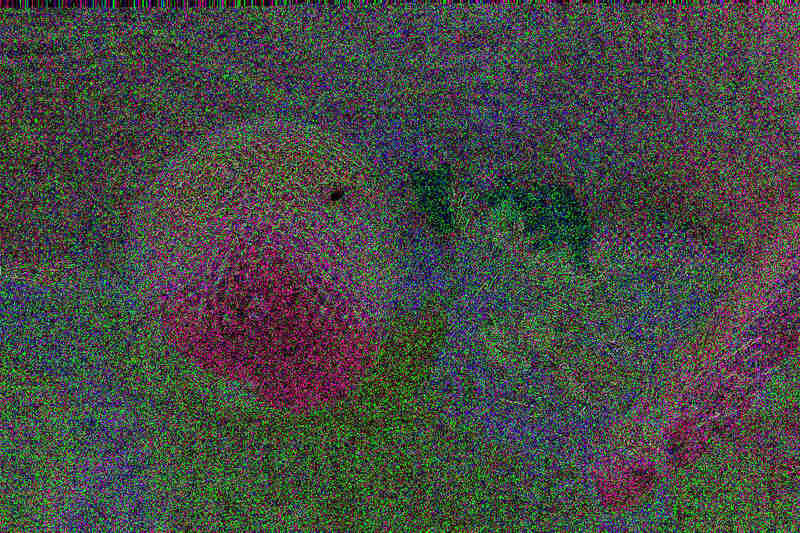 I took a high-res image (see below) and input it into GIMP, decomposed it, made only scale 1 visible, levelled it (as per FAQ), then exported the image as a Tif image, as I wanted to investigate the effects I could achieve CAMERA RAW followed by using layer blending in Photoshop. Fiddling with saturation and exposure, in Adobe Camera Raw I crreated an exciting abstract image that I really want to make into a large print. Sadly, as soon as I transferred the image from ACR into Photoshop, all the vibrant colours disappeared. Can anyone please advise ?? 3. Disappointing image after input to Photoshop - all vibrance gone ! It seems to me that the processing done in the RAW to TIFF conversion as the image is processed into Photoshop totally corrupts the colours. First, it looks to me like your second two images are just different. I see streaks at the top of the third, that I don't see at the top of the second. When I layer the two images in Photoshop and flash to compare, one of them appears to be shifted several pixels down with respect to the other one. I suppose those aspects could be explained if you grabbed different parts of the screen to show us. But then, it isn't just vibrancy that has been lost, but rather the whole nature of the pattern. 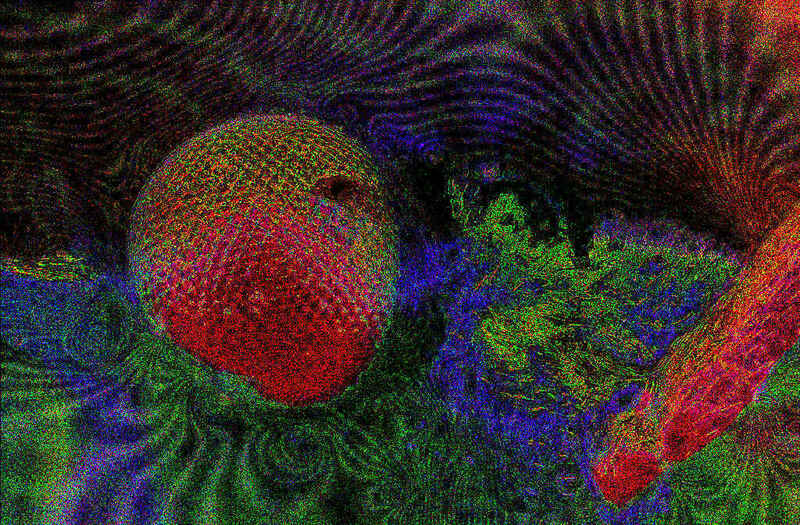 Your third image is full of noise, and most of the beautiful contour lines have disappeared. 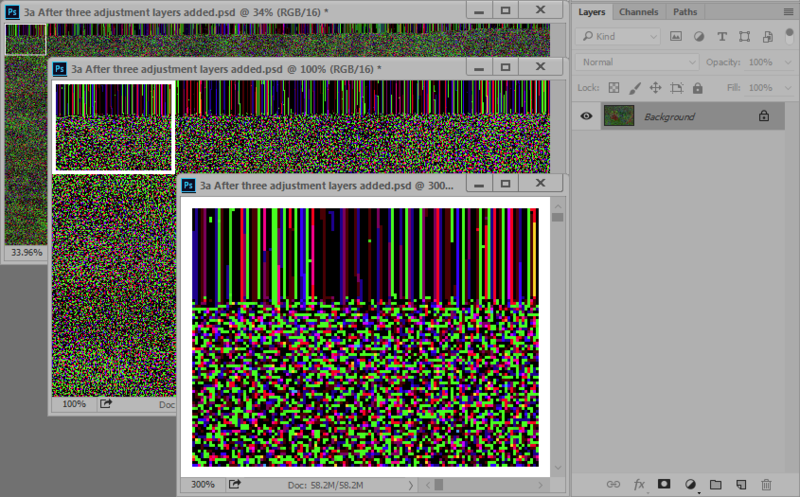 In the histogram, your third image has a green profile that has two peaks, while in your second image it has only one. 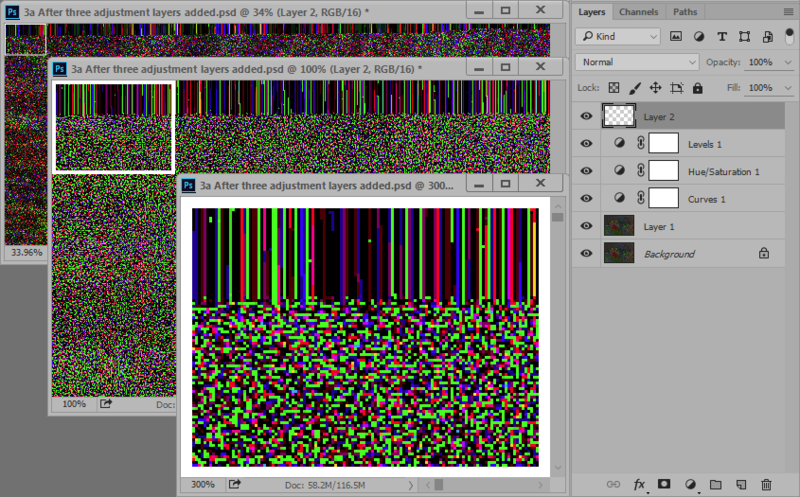 Just seeing the images, I would suspect that these are two different levels in the wavelet decomposition. But I can't make that idea match up with what you said you did -- unless maybe that's a layered TIFF you generated, with different wavelet levels on different layers, and ACR showed you one while Photoshop showed you another. Second, I'm not sure what you mean by "transferred the image from ACR into Photoshop". The "Adobe Camera Raw" that I know is a chunk of stuff already installed inside Photoshop as a plugin. Its window gets opened whenever I load an image in camera raw format into Photoshop. After I'm done with my manipulations, I click the "Open Image" button. The Camera Raw window closes, and the pixels then appear as an image in the main Photoshop window. I'm pretty sure that's not exactly the same workflow that you're using, because I'm pretty sure there are no camera raw formats involved in the process you've described. Third, when I see you write "RAW to TIFF conversion", I'm concerned that you have a fundamentally incorrect view of what RAW means. RAW formats are essentially direct dumps of what the camera's sensor produces: one value per pixel, measuring simple intensity through one color cell of a Bayer filter. When ACR does RAW to TIFF conversion, the main thing that it's doing is interpolation, replacing that single value per pixel with three values per pixel (RGB) by looking around at what values neighboring pixels saw through their own cells of the Bayer filter. I'm pretty sure nothing like that is happening in this case. Instead, you're using some software that just happens to be named "Camera Raw" (because it also does raw conversion) to do ordinary modifications like saturation and curves adjustments (which it conveniently renames "exposure", "contrast", and so on because those are intuitive names for the controls that it provides over the curves). OK, now that I'm done with my long version of a primal scream, I'll ask for some more information. Please tell us exactly what you're doing, step by step, especially in the steps where you transfer the image from GIMP into ACR and ACR into Photoshop. Thanks Rik for the long reply, and my apologies for confusing you. It is quite possible that I sent you images from different "runs" that I made. During the course of the day today, I will repeat the whole process, documenting exactly what I do at every point in the journey. Interesting -- and definitely unexpected! In that case, please show us a screen grab of the entire Camera Raw window, including its controls, just before you hit Open Image. Hi Rik - I estimate it is about 2am where you are ?? I have created a folder with a screen shot at every step along the way - about 500mb at present. Any suggestions how I can get them to you ? After a day spent fiddling and trying lots of different options, I think that I can now say with reasonable certainty that although a lot of vibrance in the tif image that I edit in Camera raw becomes murky when I "OPEN IMAGE" and bring my tweaked image into Photoshop proper, by copying the background to a new layer, then applying various adjustment layers until I get the on-screen image looking like I want, it all goes murky once again as I flatten the image. So - to get the most colourful image, the only way seems to be to take a screen shot (losing a lot of detail in the process), as there seems to be no way to get the colourful image out of photoshop, as flattening loses the colours, as does outputting the layers in a tiff file. Not quite that bad. It was about 12 midnight. I'm in US west coast time zone, UTC-8:00. Your message is timestamped 11:54 pm my time. Any of the usual large-file transfer mechanisms work OK, for example DropBox, or wetransfer.com (free up to 2 GB), or Google Drive. I suspect this appearance has something to do with the fact that your lowest-level wavelet data will have by far its strongest information at the level of 1 pixel versus the adjacent pixel. That phrase "losing a lot of detail in the process" tells me that you're viewing the image at less than 100%, in which case what you're seeing is some average of the actual pixel values. In that case a problem with flattening could appear if Photoshop applies the adjustment layers and averaging in a different order before the flattening is done. It would be very interesting to know whether this problem still occurs if you carry out the whole process while viewing at 100%. If you still can't figure it out, then the most valuable thing to send me would be a file in PSD format, containing the layered image as it exists just before you do the flattening. That, combined with screen captures showing what you see, should let us figure this out. Joy, thanks for sending me your files to work with. As I speculated, your problem is caused -- more precisely "revealed" -- by how Photoshop displays images at less than 100% resolution. Here are a couple of screenshots that illustrate. I'm displaying the same image at three different resolutions, and I've added a white rectangle so that we can tell exactly what's being displayed where. First, here is the .psd file that you sent to me, displayed by Photoshop in its original layered form. Then, here is the same image after flattening. 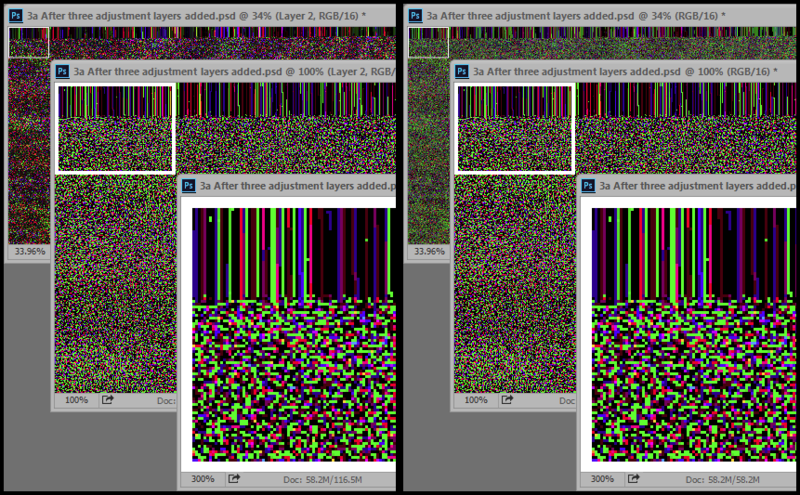 As you can see, there's no difference in the actual pixels, which are shown in the 100% and 300% views. The difference is only in the reduced view, the one shown here at 33.96%. Clearly, Photoshop is generating that reduced view differently in the two cases. I don't know exactly they do it, but obviously the method is very sensitive to the scale that is used. Now, if the resizing for display were being done perfectly, all that we would see in the animation is the image alternating between two slightly different sizes. In the gestalt, I think we can see the size change happening. But concentrating on say those vertical stripes at the top of the image, we see two very different patterns -- and yet all that's been done is to display the same image at two slightly different scales! If you look carefully at the rest of the pixels inside the white box, you'll see the same thing going on. These two screen displays are wildly different from each other, and yet all that has changed is the display size. I have not tried to reproduce your problem with Camera Raw, but I have no doubt that it's due to the same underlying problem. ACR is probably showing you a reduced size image corresponding to the layered form, but when you send the image to Photoshop it's generating a reduced size image corresponding to the flattened form. I'll bet that if you compare before and after Open Image at 100% instead of size to fit, you'll see that the colors are nicely preserved between actual pixels in ACR and actual pixels in Photoshop. Now, at the top of this post I wrote that your problem was caused, more precisely "revealed", by this issue of how Photoshop generates reduced size images for screen displays. The reason I say "revealed" is that, given the actual pixels you're generating, you're going to have the same problem with any display method. The image you sent me is size 3908x2602. If you had a monitor that large, so that you could display the whole thing at actual pixels, then when you stood far enough back that your eyes could not resolve individual pixels, what you'd see would look pretty much like what Photoshop shows at reduced scale for the flattened image. In a word, "blah". Likewise, if you tried printing the image at full resolution, you would get "blah" -- probably different blah from what the monitor shows, because of ink spreading, but blah nonetheless. Looking at it another way, those beautiful colors and patterns that you so enjoy are not generated entirely by your exposure/contrast/levels adjustments. Instead, they are generated by those adjustments, followed by some unknown process that ends up computing or selecting intensely colored components for display at reduced resolution. Indeed, doing a screen capture of the exciting colors may be the only way to preserve them! I hope this is helpful. It's an interesting problem. Obviously this sort of thing doesn't happen with typical images, or Photoshop would be using a different method. What reveals the issue is your use of the low level wavelet data, which by construction packs most of its information into variation between neighboring pixels. Given my mathematical background, I'm actually curious why there's any large scale structure in this image at all. I think the multiscale decompositions that I'm most familiar with would not do that. But that's a matter to be explored at another time, because I suspect it will take quite a while to make sense of. Rik said "Indeed, doing a screen capture of the exciting colors may be the only way to preserve them! " Sad to know, but thanks ! I have taken a chance and submitted the 1920x1080 screen shot to my Photo Club, but am not expecting much joy, as most memberts are waay to traditional. 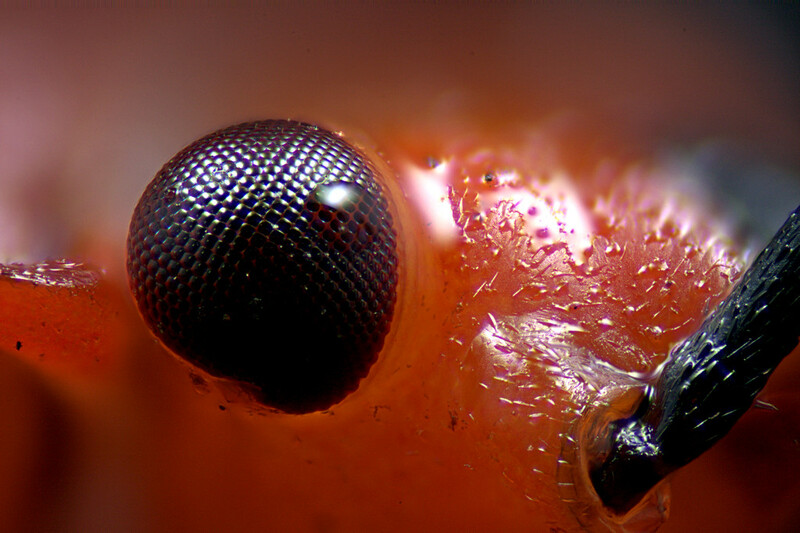 I have called it "Pointillistic Abstract of a bug's eye ! Will let you know how it goes next wednesday evening - your time. That happens way too much -- bad teaching, IMHO. One of the least comprehensible texts I ever saw was the introductory calculus book being used by my friends in college. Fortunately I was in a different sequence, where the prof basically ignored the textbook and taught the stuff so it made sense. Ha! If it's anything like my camera club, the judge will be dumbfounded and desperately try to find something intelligent to say, winding up with something vaguely positive and a mark of 8.5/10 . I have a go at volunteer assistant teaching 13 year old girls electronics - extra curricular. One minute they can't take 7 from 20, the next they ask about current going through two resistors. Do some electrons go one way and some the other, or is it, like you know, um, that wave probability density function, like, thing where they all like sort of like go everywhere. Like. In my first year varsity, I had high hopes, and wanted to major in pure physics and Maths, but the maths got me - so I switched to BSc Elect - which only required a lower level of maths. The next year, I had a brilliant lecturer, full of life, and got a first class pass. Sadly, the second year lecturer was dull. Many years later, I heard about a friend who got a Doctorate on "Mathematical Visualisation". It was then that I realised what my problem was - I just could not visualise second level differential calculus. Chris - I am in the top level of our club, and need 8/10 (24/30 for us) to get a promotional award, so 8.5 will put a smile on my face ! Will keep you posted. Do some electrons go one way and some the other, or is it, like you know, um, that wave probability density function, like, thing where they all like sort of like go everywhere. Do you really get questions like that? Those are very profound! On this side of the pond we distinguish between arithmetic (taking 7 from 20) and mathematics (maths) which is the theory behind it. You can be an expert on football without being able to kick! re the image: The problem is that the detail is in individual pixels. I wonder what would happen if you scaled the image up by a factor of 2? Photoshop offers five different resampling algorithms. Maybe PhotoShop's view rescaling algorithm is scale-independent, maybe it's not and knows that individual pixels are noise. Missed this - Yes whenever they can. BBC TV "Horizon" could have been designed to provide teacher-bamboozling material. Pity they don't do Ohm's Law..